Thanks to Richard Blaustein (http://www.clarenceashley.com) for the research, photos, and edited article below. Over 60 years have passed, but there are people in East Tennessee who still remember the fiddler’s convention held at Mountain City during the second week of May in 1925. The floor of the high school auditorium almost collapsed in the press of the crowd and the courthouse and grade school auditorium were opened to accommodate the overflow. This convention was a watershed in the development of professional country music. The best musicians in the area around Mountain City were invited. It was an area rich in music and the old timers who were there invaribly recall this convention as the best ever. Charlie Bowman, born at Gray Station, Washington County, Tennessee, met the Hopkins brothers and Tony Alderman at this convention and they were so impressed that they persuaded him to join The Hill Billies. Al Hopkins headed The Hill Billies, played the piano, led comedy routines, served as business manager, etc. His group was first among the high flying bands of the ’20’s. They toured through the eastern United States as vaudeville performers, made a serious attempt to copyright the name “Hill Billy”, sold stock in “The Original Hill Billies” during the late ’20’s, played for President Coolidge and made a movie short for Warner Brother (Vitaphone) in New York in 1928. They followed Al Jolson’s “Singing Fool” on the Warner Brothers lot. Clarence “Tom” Ashley lived near Mountain City and had begun his entertainment career in medicine shows a decade earlier. He recorded with Byrd Moore and Clarence Greene as “The Hotshots” and with Doc Walsh and Garley Forster as the Carolina Tarheels and with a group he called the Blue Ridge Entertainers. Roy Acuff began his musical career with Ashley in a medine show during the 1920’s. G.B. Grayson also lived near Mountain City and was one of the most influential fiddlers of the ’20’s. At another convention at Mountain City in 1927 Grayson met his recording partner Henry Whitter, but he appeared more frequently with Ashley. They toured the coal fields of West Virginia together and they were heard together at this convention. Grayson was killed in an accident on August 16, 1930. “Fiddlin’ Dud” Vance (Dudey Vance) was another recording pioneer then known over a wide area of the Southeast. He was winner of championship contests in Tennessee, Florida and Oklahoma. He operated a country music park and resort in East Tennessee. Most of these musicians came to Mountain City to compete for $40 in prize money with the first place winner takiing a $20 gold piece. Three of the winners and their tunes are remembered: G.B. Grayson with “Cumberland Gap”, “Fiddlin’ Dud” Vance with “Twinkle Little Star” and Charlie Bowman with “Sally Ann”. 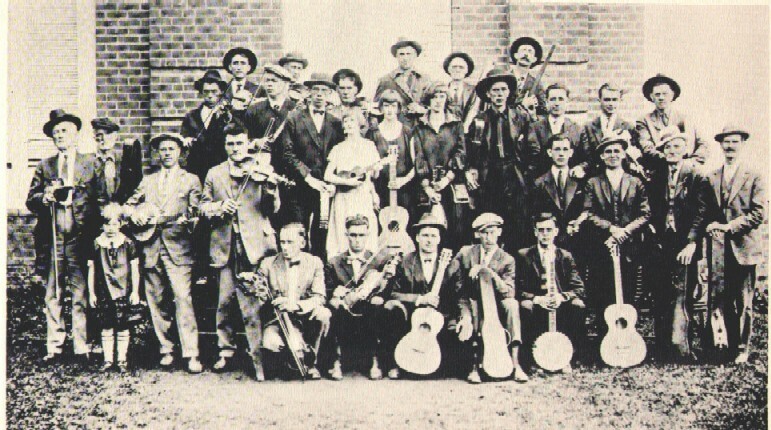 The positive response to rural artists had surprised executives of the radio and recording industry and at Mountain City a third surprise was in store: these musicians learned that people who knew them only from their recordings and broadcasts were willing to lay down good money to see them in person. This convention may have inspired other musicians to try their hand at recording and radio. Tony Alderman erected a small portable radio station at Mountain City and gave the first demonstration of radio transmitting that had been seen there. He recalls that G.B. Grayson lingered by the microphone longer than anyone else while Grayson’s neighbors listened at the receiver a short distance away. Grayson was deeply interested in recording and Tony recalls being delighted to hear, two years later, that Grayson was recording. Within the same two years, Charlie Bowman, Fiddlin’ Dud Vance and “Tom” Ashley found their way to recording studios. This entry was posted on November 28, 2011 at 1:30 am and is filed under articles/profiles, music history. You can follow any responses to this entry through the RSS 2.0 feed. You can leave a response, or trackback from your own site.